When I first set out to teach the novel La ciudad de las bestias by Isabel Allende five years ago, I wrote chapter guides for each chapter as I taught it through a year. I never dreamed that teachers far and wide would use the document I made publicly available a few years ago. Still, it continues to be my most-requested resource. But you see, I wrote it for my students. When I wrote the review vocabulary, I included words I knew my students had seen in previous years or in our regular vocabulary. Word auto-corrected my lists in weird ways I didn’t catch. I forgot what words were included in previous chapters and included them again (and again, and AGAIN). My non-native Spanish made a few constructions awkward or I simply made mistakes. And I didn’t even know how the plot ended, so I missed questions that were important to the plot, and I included random questions that were little details that didn’t end up having anything to do with anything. I knew how I wanted to incorporate culture and technology, so I didn’t bother writing those down. And I included bonus questions that may or may not have been worth asking as a bonus question. Each chapter’s section begins with a vocabulary list. I chose the words based on their frequency of use, application to advanced themes, or importance in the chapter. Words and phrases that are especially important to the plot or that help students improve their proficiency are emphasized. Within the Vocabulary section, several activities get students using the words and phrases in memory-boosting ways. Translations of the words are not included so that you can determine how students interact with the meanings of the words. All words and phrases and their English translations are listed alphabetically in a dictionary at the end. After the first several chapters, each chapter includes a list of vocabulary words previously mentioned in a Vocabulario section. Sometimes these words are variations of previously used words. These questions enhance memory by causing students to relate vocabulary meaningfully to the world around them. This section lists pairs or groups of words that are related somehow. Boost memory by asking students to make connections among vocabulary words. Are they all parts of the body? Things that you wear? Words related to injuries? Students perform a task specifically related to improving their proficiency, such as describing a scene, making a comparison, or narrating a story. Students have the opportunity to practice interpersonal conversation by talking with a classmate or friend about something related to the chapter and its vocabulary. Students practice idiomatic expressions, a key to developing advanced proficiency, in a way that uses their imagination, which increases memory. This section is included from time to time to ask students to make a cultural connection using vocabulary words and concepts. This section is included from time to time to give tips on how particular words are formed or function in sentences. The second part of each “chapter” is a set of questions about the plot of the story, accompanied by proficiency-boosting activities. These questions usually relate to major plot developments and often ask students to think critically about what they’re reading. This activity asks students to relate something in Alex’s story to their own world. Making cultural comparisons is an important skill for advanced students. or character sketches or looking up pictures or videos of things or actions mentioned in the chapter. 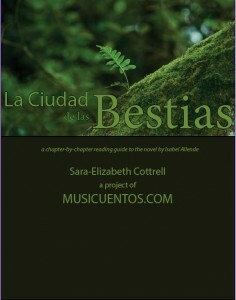 This activity is included from time to time to suggest ideas for how to find out more about the world of Las bestias. This activity is included from time to time to point out a grammatical function in a chapter and ask students to interact with it in some way. Ready to see a sample? Check out the guide for Chapter 8. I had a couple of questions or issues that I could use some virtual collaboration with 🙂 I’ve followed your blog for a couple of years and want to thank you for all of your guidance! After 10 years off from teaching to stay home with my kiddos, I could/can use all of the help I can get. This is the first year that my school has offered AP and I am in way over my head. I have a very small class (7 kids, 2 heritage, 5 typical L2 learners) who are super introverted. They love worksheets and grammar. Not so much communication, to my dismay. After reading Ciudad de las Bestias, I wonder if this might intrigue them. Perhaps this would work with their quiet natures? I’m sure this would have worked better if we had started first semester and read a chapter a week, but, alas, I have just gotten around to reading it myself over winter break. The resources that you have online (at least the preview) look amazing and will be tremendously helpful! 1. How much actual reading do you do in class? Do the students read for HW? I’ve read your blog about HW, but wondered how you fit this novel into your class. We have 42 minute class periods. 2. Would it even be possible for the class to read in a semester? With the exception of 2 students (one heritage, one superstar overachiever), I am fairly confident that my kids don’t have a prayer to pass the AP Exam, so I don’t want to spend too much time dwelling in the test. Those kids will do a review on their own, they are so motivated! 3. What other themes do you fit into this book? I’m thinking global challenges, public and personal identities just off of the top of my head. In my experience, the book can be completed in 12 weeks if you desire. The year I read this with Native Speakers, students had a copy & read at home: sometimes we would read 1 chapter in class (2 chapters were assigned weekly) It is a great book, very rich in culture! I bought Sara-Elizabeth’s Study Guide & I can’t wait to start. We’ll begin around Jan 15th. What level spanish do you recommend a study of Cuidad de las Bestias for? Thanks. Hola Carolina- I wouldn’t recommend students attempt Ciudad before their third year of study. I used it in the fourth year.